"Hucul" redirects here. For the horse breed, see Hucul pony. For the surname, see Hucul (surname). Hutsuls (Ukrainian: гуцули, hutsuly; Polish: Hucuł, plural Huculi, Hucułowie; Romanian: huțul, plural huțuli) is an ethnic group spanning parts of western Ukraine and Romania (i.e. parts of Bukovina and Maramureş). While they often have been officially designated as a subgroup of Ukrainians, however Hutsuls mostly regard themselves as a part of a broader Rusyn ethnicity, alongside two other groups from the cross-border region of Transcarpathia: the Boykos and Lemkos. There are different versions for the origins of the name Hutsul. An explanation is that it comes from the Romanian word for "outlaw" (cf. Rom. hoț—"thief", hoțul—"the thief"). Other explanations place their origins in the Slavic kochul—"wanderer", "migrant"—in reference to their semi-nomadic lifestyle, to the name of the Turkic tribe of the Uzy, and even to the name of the Moravian Grand Duke Hetsyla. However these are obsolete and non-academic assertions. No valid theories have been proposed yet. The name is mostly an exonym, used by neighbouring groups and not Hutsuls themselves, although some have embraced it. Hutsuls inhabit areas situated between the south-east of those inhabited by the Boykos, down to the northern part of the Romanian segment of the Carpathians. Several hypotheses account for the origin of the Hutsuls. According to Romanian historian Nicolae Iorga, "huțuli" or "huțani" are denationalized Romanians. Other opinions show that Hutsuls descend from the White Croats, a Slavic tribe that inhabited the area from the 4th until the 12th century, or from the Slavic tribe of the Ulichs, who had to leave their previous homes near the Southern Bug river under pressure from the Pechenegs. Hutsul is usually considered to be a dialect of Western Ukrainian with some Polish influences. Since the joining of Transcarpathia by Soviet Union compulsory education has been conducted only in standardized literary Ukrainian. In recent years there have been grassroots efforts to keep the traditional Hutsul dialect alive. Traditional Hutsul culture is often represented by the colorful and intricate craftsmanship of their clothing, sculpture, architecture, woodworking, metalworking (especially in brass), rug weaving, pottery, and egg decorating (see pysanka). Along with other Hutsul traditions, as well as their songs and dances, this culture is often celebrated and highlighted by the different countries that Hutsuls inhabit. Ukrainian Hutsul culture bears a resemblance to neighboring cultures of western and southwestern Ukraine, particularly Lemkos and Boykos. These groups also share similarities with other Slavic highlander peoples, such as the Gorals in Poland and Slovakia. Similarities have also been noted with some Vlach cultures such as the Moravian Wallachians in the Czech Republic, as well as some cultures in Romania. Most Hutsuls belong to the Ukrainian Greek Catholic Church and the Ukrainian Orthodox Church. Hutsul society was traditionally based on forestry and logging, as well as cattle and sheep breeding; the Hutsuls are credited with having created the breed of horse known as the Hucul pony. One of the main attributes of Hutsul males is their bartok, a small head axe on a long handle. 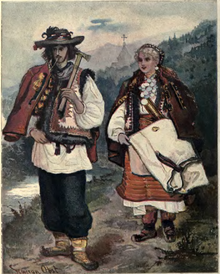 They use unique musical instruments, including the "trembita" (trâmbiţa), a type of alpenhorn, as well multiple varieties of the fife, or sopilka, that are used to create unique folk melodies and rhythms. Also frequently used are the bagpipe (duda), the Jew's harp (drymba), and the hammered dulcimer (tsymbaly). The Hutsuls served as an inspiration for many writers, such as Ivan Franko, Lesya Ukrainka, Mykhailo Kotsiubynsky, Vasyl Stefanyk, Marko Cheremshyna, Mihail Sadoveanu and Stanisław Vincenz, and painters such as Kazimierz Sichulski and Teodor Axentowicz—famous for his portraits and subtle scenes of Hutsul life—and Halyna Zubchenko. Sergei Parajanov's 1965 film Shadows of Forgotten Ancestors (Тіні забутих предків), which is based on the book by Mykhailo Kotsiubynsky, portrays scenes of traditional Hutsul life. Every summer, the village of Sheshory in Ukraine hosts a three-day international festival of folk music and art. Two Hutsul-related museums are located in Kolomyia, Ukraine: the Pysanky museum and the Museum of Hutsul and Pokuttya Folk Art. Traditional Hutsul sounds and moves were effectively used by the Ukrainian winner of the 2004 Eurovision song contest, Ruslana Lyzhychko. The Romanian Hutsuls have a Festival of Hutsuls at the Moldova-Sulița village in Suceava county. ^ "Hutsulshchyna: The Name and Origin". KosivArt. Retrieved 2008-07-23. ^ "1. ВСТУПНІ ЗАВВАГИ. Юрій Шевельов. Історична фонологія української мови" (in Ukrainian). Retrieved 2008-07-23. ^ "Youth organizations of Prykarpattia initiate giving regional status to Hutsul dialect". Ukrainian Independent Information Agency. 2006-06-21. Retrieved 2008-07-23. ^ Clark, Kathy and Bill (1997-07-12). "Kosmach". Kathy and Bill Clark's Ukrainian Vacation. Retrieved 2008-07-23. ^ "The Hutsuls People". Ensemble "Halychyna". Archived from the original on 2008-05-22. Retrieved 2008-07-23. ^ Volodymyr Kubijovyc, ed. (1989). "Hutsul region". Encyclopedia of Ukraine. 2. University of Toronto Press. Retrieved 2008-07-23. ^ "Hutsules" (in French). Archived from the original on 2008-05-21. Retrieved 2008-07-23. ^ "Dress". encyclopediaofukraine.com. Retrieved 2014-09-14. ^ "Ukrainian Tribal Divisions and Ethnographic Groups". Archived from the original on 2001-06-29. Retrieved 2014-09-14. Wikimedia Commons has media related to Hutsuls.